I recently wrapped up teaching duties on a course in Digital Public Humanities, a class offered via Brown University’s Public Humanities M.A. program. You can view the course site, which includes our syllabus, major readings, and a blog, here. This class was both my first digital humanities course and the first class I ever taught as part of a graduate program. I wanted to debrief (and maybe also decompress) here, in the hopes that thinking out loud about the shape and outcomes of the course might help me as well as other people interested in digital humanities, public humanities, public history, and/or graduate-level teaching (among other topics). Before diving into the debrief, I’d like to thank the students who took this course, because they were all great. Thanks again to Dylan Cole-Kink, Bárbara Elmudesi, Nico Larrondo, Eddie Robles, Caroline Stevens, Sandra Strauch, and Liza Yeager. Thanks also to Alyssa Anderson, Andrea Ledesma, Reya Sehgal, and Marley-Vincent Lindsey for stopping by at various points in the semester and for contributing to class discussions. I’d also like to thank Susan Smulyan for her comments on my syllabus and for our (continuing!) conversations on how the Public Humanities program and the John Nicholas Brown Center for Public Humanities and Cultural Heritage (JNBC) might support students interested in digital humanities tools and topics. Jim Egan and Steve Lubar patiently helped me think through ideas related to the course. The Brown University Library Center for Digital Scholarship supported our class with access to the library’s new Digital Studio, and Bruce Boucek, Brian Croxall, Elli Mylonas, and Patrick Rashleigh graciously took time to meet with students and provide recommendations for digital tools and resources. When I came to Brown, I thankfully didn’t have to answer the question “What is Digital Humanities and what is it doing in a Public Humanities program?” Students and faculty at the JNBC have been interested in digital tools, methodologies, and scholarship for a while now: for example, Susan Smulyan taught a class on Digital Scholarship in the Spring of 2010, and more recently, Steve Lubar had students working with digital platforms as part of a Fall 2015 Museum Collecting and Collections course. Brown also has a long history of investing time, labor, and resources into digital scholarship, as this recently-rediscovered video (by my Twitter feed, at least) video of Bob Scholes examining the potential of hypertext can attest to (Bob is also the brains and heart behind the Modernist Journals Project, an early digital humanities project that began at Brown and is currently co-managed by the JNBC and The University of Tulsa). And as someone who read (well, “read”) Hypertext 2.0 as an undergraduate in the early 2000s, it was neat to end up at the same school as George Landow sixteen years later. That being said, I don’t expect current graduate students to be familiar with the history that preceded them here at Brown; heck, I didn’t even realize that Landow was at Brown until I started developing my reading list for this course. And while digital humanities work has been going on at the JNBC for some time now, I’m the first hire here with the words “digital humanities” in my job title. Part of my job over the course of my postdoc (which is a two-year position) is to help the Center and its Public Humanities program think about the place of digital projects and scholarship within the program, what resources students, faculty, and collaborators might need, and how we might better prepare our students for the uses of digital tools and publication platforms in their professional lives. While digital humanities practitioners may be tired of talking about what digital humanities is or is not (as they remind us, again and again, on Twitter),I think it’s important to remember how the rapid changes to digital humanities look to people just getting started: every semester there seems to be new tools, additional wrinkles to ongoing debates, broken links, exciting projects, and reactionary think pieces to wade through. While many people in DH may be sick of defining, redefining, and defending DH, many students who are just learning about DH are interested in how the term came to be valued in certain contexts, what the historical narratives (and pre-histories) have highlighted, and why it’s such a touchy subject for so many academics. They want to know who to follow on Twitter. They need context for your subtweets. They read the recent essay in the Los Angeles Review of Books and don’t immediately grasp why it made people’s heads explode. They may not know what to Google yet. For my first graduate-level Public Humanities course (I’ll teach two during my time as a postdoc here), I thought it would be helpful to design a semester schedule that provided students relatively new to DH with lots of readings, as well as examples of digital projects and tools. I also wanted to include time and space for students to work on their own digital projects: many of the courses offered in our program have similar components, so our students have opportunities to work on public-facing initiatives at varying scales. In various courses, our “Public Humans” have aided faculty-driven and community-led initiatives, developed their own projects, supported or created on-campus or external institutional partnerships, led neighborhood tours, worked in traditional and non-traditional educational spaces, and staged physical (and digital) exhibitions on and off campus (among many, many other forms of public engagement). My sense was that we’d spend the first half of the course on readings and discussions, and the second half on project development. The second half would also include readings (primarily suggestions for best practices on creating, developing, and managing digital projects), but class time would be devoted more to students brainstorming project ideas, testing out digital tools and publishing platforms, and circulating proof-of-concept work for feedback and revision. The space of the classroom would shift from a discussion-based model to one that more resembled a workshop space, and my role as instructor would shift from conversation starter and moderator to more of a project consultant. The “deliverables” of the course were imagined as four blog posts (three responding to readings and class discussions, and one outlining the author’s digital project) and a “Version 1.0” of a digital project. In addition to the publicly-circulated finished version of the project, students would also write a project description loosely modeled on documentation genres like components of grant proposals or project documentation materials. 1. Thinking about “Digital Public Humanities” as a distinct version of “Digital Humanities” can be productive and useful. As someone who had moved pretty quickly from an English Department to a Public Humanities program housed in an American Studies program (I defended my dissertation in August 2015 and began my postdoc in September), I wanted there to be opportunities to revise the syllabus and to shift the trajectory to suit the research interests and experiences of students. If you’re looking to increase the amounts of imposter syndrome in your bloodstream, then you might want to ask your doctor if making the move from one academic department to another is the right move for you (provided you have health insurance). I’m still figuring out what Public Humanities and American Studies are all about, as well as how digital tools, archives, projects, and publication platforms, might be used, conceptualized, or even resisted by academics and professionals who inhabit and value these particular fields and their ongoing conversations. I’ve found the Digital Humanities Caucus of the American Studies Association to be a particularly helpful resource, and I’m glad they exist. 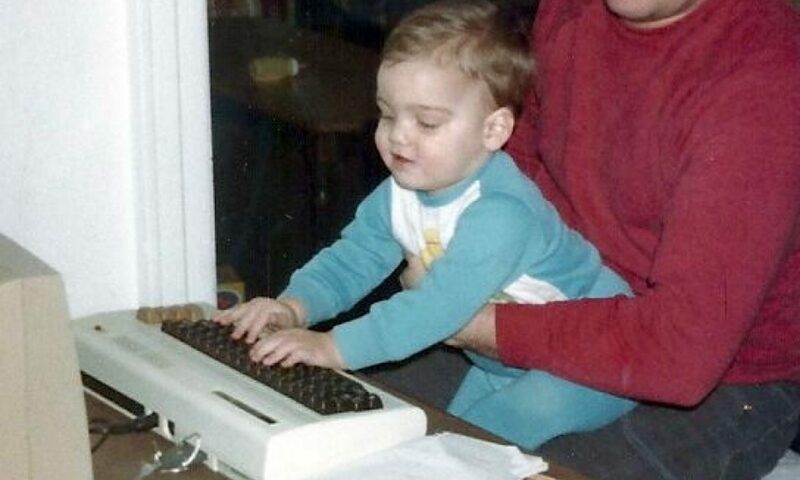 I’ll admit that I was also initially reluctant to “own” my job title as “Postdoctoral Fellow in Digital Public Humanities,” to the extent that I would occasionally call myself a practitioner of “Public Digital Humanities” to shift the emphasis back to a sequence of words that I was more comfortable inhabiting. Does the order of the adjectives matter? I’ve started to think they do, and I’ve gradually grown comfortable with the look of “Digital Public Humanities” on my business cards. Placing the idea of the “Public” at the center of “Digital Public Humanities” makes it seem less like the idea of appealing to “the Public” is rhetorically tacked-on to our investments in digital projects. 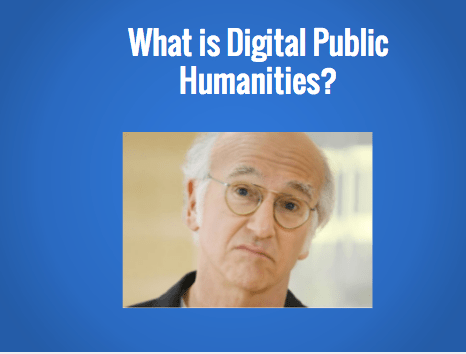 Over the course of the semester, my Public Humanities students were quick to critique digital projects and digital humanities practitioners that didn’t seem to be thinking productively about the kinds of publics that their work aimed to reach and serve. They sometimes found that the rhetoric of a successful NEH grant application didn’t match the realities of the projects or the usefulness of the tools created with these resources. They discussed the invisible (or sometimes explicit) assumptions behind creating public-facing works that assumed a degree of familiarity with certain literary texts and modes of reading. They challenged the remediation of curatorial contexts that remained unwelcoming to visitors from varied ethnic and economic backgrounds. They questioned the value of participating in “gamified” crowdsourced initiatives that seemed designed primarily to find free labor for academic research. This is not to say that these students (or, more generally, Public Humanities or Public History students) are the only ones thinking about the uses and implications of public-facing digital initiatives. Our readings and class discussions drew heavily from texts and scholars doing digital humanities work: Lauren Klein’s considerations of archival silences, Moya Bailey’s discussions of the ethical dimensions of writing about social media, Alex Gil’s investments in minimal computing and questions of accessibility, Mitchell Whitelaw’s notion of “generous interfaces,” among others (the work of Nathan Jurgenson, Lori Emerson, and Miriam Posner was also well-received by the class, to name a few more people). You can see the uses of some of this scholarship over at our course blog. Students considered the uses (and limits) of digital mapping tools to make the histories of Chile’s concentration camps visible and accessible. They explored ways to use digital tools and publication platforms to question claims of cultural authority in museum galleries and to unearth secret heroes of archival collections. They examined best practices for digital curation projects at nonprofits with limited resources, developed strategies to create publication platforms for artists, assessed platforms and interfaces to document uses of urban spaces. They modeled the uses of text analysis and created visualizations of fanfiction archives to show the communities who create and curate this work how to take on similar projects. All of these students considered the needs and interests of specific public spaces and audiences, explored avenues of accessibility to digital, economic, and material resources, and experimented with digital tools and platforms that were relatively new to them. There’s also an impressive range of interests, critical lenses, and research questions on display in this work. They devoted a tremendous amount of thought, revision, time, and labor to their discussions and blog posts (so much so that I decided to only require 3 posts instead of 4). When I was initially developing this course, I imagined that requiring students complete a “Digital Project 1.0” made the most sense. My image of “1.0” was a public-facing digital publication — an exhibit, or a particular visualization, or a small-scale digital initiative — that clearly situated itself as the first step in an iterative, still-developing process but also seemed self-contained and “finished” enough to stand on its own. I would be flexible in letting students select the publication platforms and boundaries of their work. What I found in practice was that a semester workload, especially one with so much reading materials and discussions, didn’t leave much time for students to create something as fully-formed as this vision of “1.0.” I eventually started calling the major assignment “Digital Project 0.5.” Instead of the language of “proof-of-concept” or “prototyping,” terms that suggested (to our class at least) material that seemed more functional or fully-formed, students spent more time experimenting with content management systems, trying out particular exhibit-building platforms, considering questions of scale, researching audience needs. The work was at a smaller scale than I initially imagined. Sometimes it was very careful and deliberate; at other points it was playful and experimental. In addition to the individual work students completed at the end of the semester (on their own and in “workshop” class meetings held at the library’s Digital Studio), there were points in the semester where we’d take time to play with particular tools or platforms. As an introduction to Omeka, I asked students to create digital archival records of their week and upload them into a digital sandbox space, an informal exercise that led to a discussion of personal data creation, remediation, and the cultural authority of metadata standards and practices. A discussion of Twitter bots led to an afternoon where we (somewhat frantically, but in a good way) attempted to make our own in the span of an hour by following Zach Whalen’s guidelines. I wish we had done more of these exercises, which attempted to couple the very real material limitations of certain tools and platforms with more arbitrary and playful constraints (almost Oulipian, if that’s not too obnoxious to say). Digital humanities work within and outside the classroom is often driven by “deliverables,” a word I liked to use in meetings at my previous job at Northeastern’s Digital Scholarship Group because I knew it amused my boss, Julia Flanders. Deliverables can be useful in particular contexts: it’s always good to document what a project (or a class) is working towards in a given amount of time. Deadlines, particularly deadlines for public-facing work, can be extremely useful as motivators. That being said, I wondered how “public” our digital labor in a Digital Public Humanities course needed to be. I was asking students to not only try new tools and platforms, but also telling them to sign their names to public-facing projects that documented the first time they had ever used them. I was invested in a model of digital project development that championed the benefits of collaboration and long-term, deliberate planning, but I was also insisting that we do a lot in a few short weeks. A “Digital Project 1.0” model seemed, in this context, to expect that a person doing digital humanities work could truly do it all on his or her own, from conceiving a project to assessing its uses to developing its public-facing side to coding to user testing to revision to publication to dissemination. I know there is a tendency to assume that every individual digital humanities practitioner is marvelous, self-sustaining (and inexpensive!) project machine (read some of the job descriptions that have been circulating in the last few years), but that’s not such a good thing. I’m still trying to think through how to approach digital project development in future courses. Bringing an existing or partially-developed digital project to the class and asking them to add to it seems possible, but I’m also wary of relying on student labor in this way. I know that some schools have trajectories where digital projects are developed over multiple semesters, but I don’t know how that would be successfully implemented in a program where there’s an impressive range and variety of courses to take in addition to digital-centric classes. I’m currently inclined to embrace the early development model and its attendant messiness, to find additional spaces during the semester to have students experiment creatively with small-scale digital tasks, to allow the classroom to function as a site where deliverables might be discussed but hold little dominion. 3. Digital projects require significant investments in time, labor, expertise, and economic resources within academic contexts, and we should also think about “non-academic” contexts and their attendant needs. Questions of money and time were at the forefront of the minds of many students, particularly those who are invested in working with nonprofits or community organizations. There may be excitement and a perceived need to create digital resources in these sectors — accessible and organized archives of community initiatives, forums for discussion, tools for creative expression — but budgets for these sorts of digital endeavors are small, if they exist at all. And while academic institutions might have access to substantial data sets and compelling visualizations that make this data legible and compelling, but students often lose access to these resources upon graduation. Several needs become visible here: the need for academic institutions to collaborate more with community partners to share digital resources and explore ways to make content more accessible, the need to create low-cost (or, ideally, free) tools and applications that help groups with budgetary limitations read and act upon essential data, the need for organizations to factor the costs of digital labor and publication into their budgets when possible, the need for serious consideration of the value of particular technical skills in professional development. Should all public history or public humanities scholars learn to code if they’re not paid to code on the job? Can academics create tools that make text analysis and data visualization tools application to more immediate use-cases in community organizational contexts? Can collaborations between colleges and nonprofits share resources while also empowering partners to take on more digital publication projects or think more about regional impact? 4. Digital humanities work can and should happen outside of libraries. As I hopefully made clear at the start of this post, Brown’s library has been very supportive of the work we completed over the course of the semester: we were pointed towards impressive tools and resources, we were given a state-of-the-art space to play around in, and our work was valued as important. And before coming to Brown, I was (and remain) a huge fan of Northeastern’s Digital Scholarship Group: I even asked to have my dissertation defense hosted at Snell Library because I had come to view that institutional space and its amazing inhabitants as my real intellectual home. I still want to be a librarian when I grow up, a dream I’ve had since, like, 2013, when I first came around to how awesome librarians and archivists can be. Different libraries and digital humanities centers hosted by libraries do different things in different ways, and there are obviously public-facing digital initiatives that have benefited from the support of library staff and resources. Our Marathon, for example, would not have been possible without library IT staff, metadata specialists, archivists, and server space. Similarly, Documenting The Now looks like a tremendous initiative that is supported by library staff and centers housed at academic libraries. But I also know that some of the work being done by Public Humanities students might not easily lend itself to direct or immediate support from academic libraries. They may be working with community organizations with their own timelines, workflows, and deadlines that conflict with a library’s idea of service. They may want to host content on sites that don’t align neatly with university protocols and standards. They might be digitizing and collecting material that, for various reasons, might not be right for inclusion in a university’s digital repository. The tools and methodologies that librarians prefer might be less accessible or engaging to certain project stakeholders. There may be disagreements or personality conflicts that get in the way of collaborative initiatives that require the participation or buy-in of a library and its staff. Similarly, libraries might not have the bandwidth to support so many student-led digital initiatives, particularly projects that are still in stages of early development. They might have to devote time, labor, and resources to faculty-led or grant-funded initiatives. They might have their own projects and research interests. The digital tools and skills they privilege might be more in line with academic labor (and academic deliverables) than with the kinds of work being done at community organizations, nonprofits, museums, art galleries. I’m still thinking about how (or if, to be honest) digital public humanities work calls into question the privileging of library spaces and resources in conversations about digital humanities. I’m obviously not in favor of moving digital scholarship or DH centers out of libraries; I’m more just thinking about how alternate spaces might invite or encourage different modes of digital scholarship and collaboration (or complement, or even subvert, the kind of work being done in library spaces). Our Public Humanities program is a big champion of “shared authority,” and these investments were felt in the classroom. I occasionally used lots of slides, and those particular classes were way less fun than the discussion-based, occasionally meandering meetings we had this semester. It also takes time to create a space where investments in shared authority are clearly at work, so there may be occasional rough patches along the way for teachers and students. We started the semester with a Google Doc that featured agenda items, quotes from readings, student responses, and links from discussions. After a few weeks, we decided to move over to Slack, because Slack seemed both less unwieldy and cooler than a Google Doc. I probably have more Thoughts on Slack and how it might be effectively used in classroom contexts and digital discussions of material; I thought it was good to try out, but I wonder about its uses in non-startup-y contexts (and particularly in “shared authority” contexts). I tried to make sure that our reading list and our sample projects / extended discussions drew from the range of voices in the digital humanities community (and beyond), and it was useful to go through several drafts of my reading list (and to discuss these materials with others). I came up with a class hashtag, and we talked about how we might use it over the course of the semester. We used it a few times (and talked a bit about Twitter use more generally), but I did not require regular use (or the creation of a professional Twitter account). I have Serious Rant-y Thoughts on requiring that students inhabit public spaces in professional contexts, and I do wonder how much a class hashtag is useful beyond self-promotion of the course and its amazing instructor. Ditto for conference hashtags. I’ll save that rant for another time. I’ll likely be teaching a course called “Digital Storytelling” in Spring 2017 that builds on some of these reflections. I’ll keep you all posted on how that goes!